The Federal Open Market Committee (FOMC) conducts their March meeting on Tuesday and Wednesday. Growth overseas remains sub-par, but U.S. consumer spending is stronger and monthly job gains are up 235,000 over the last six months. Signs of moderate inflation can are evident in the personal consumption expenditures price index. This index rose 1.3% year-over-year in January. All the churn in markets during the first quarter had little impact on our assessment of fundamentals. Our WCA Fundamental Conditions Barometer remains below 50 and portfolios are defensively allocated. The latest actions by the European Central Bank (ECB) are lifting sentiment, but we are mindful that there are limits to central bank policy. Changes in the money supply, asset purchases designed to target the value of risk assets, and negative interest rates all have failed to boost underlying growth and productivity. Consider the charts below, for example. They depict basic trends in workforce and productivity growth over two time periods. 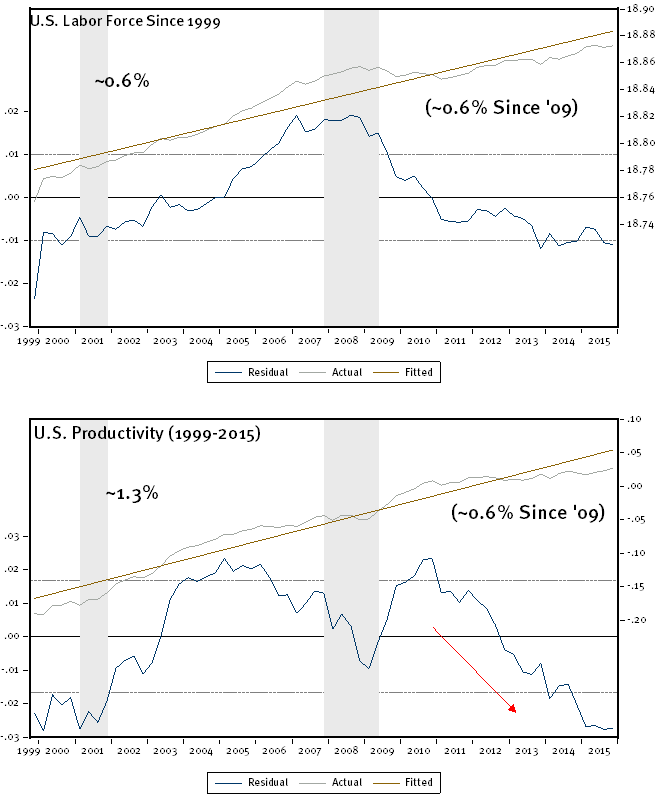 The first two charts below show growth in the U.S. labor force and growth in U.S. productivity from 1946 to 1999. Labor force grew a robust 1.9% per year and productivity grew near 1.7%, on average, during that period. Adding these two figures together supports real growth in output near 3.6% — roughly what the government estimates real growth in output actually was over that period. Moreover, the workforce grew rapidly through the 1960s into the 1980s as women and the baby boom generation entered the workforce. 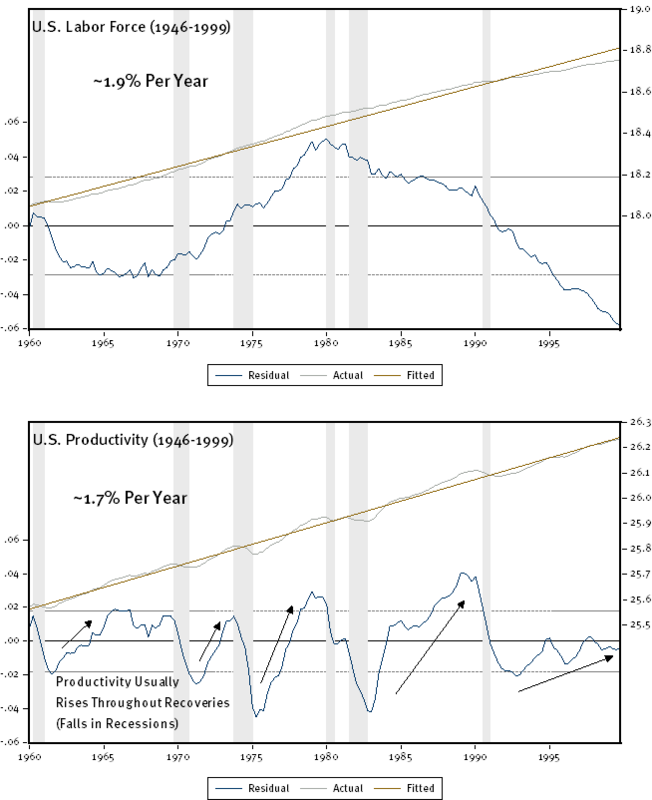 Productivity continued a steady climb from the 1940s through the 1990s, dipping during recessions and rebounding during recoveries. Things changed following the 1990s. The workforce grew more slowly (trend growth of just 0.6%) and productivity growth declined to 1.3%. These levels support a slower pace of growth near 1.9% (0.6% labor growth plus 1.3% productivity growth). This is exactly in line with the 1.9% average real U.S. GDP growth seen since 1999 and helps explain why the expansion has been so weak. Looking ahead, we expect to see these trends improve. We made no changes to our long-run growth expectation during the quarter. We continue to forecast long-run real growth near 2.5% (give or take 0.5%) over our forecast horizon. Amid the backdrop of slower secular growth, our WCA Fundamental Conditions Barometer remains below 50 (see below). We are aware that some improvement in the last couple of weeks can be seen in market sentiment, but other data has yet to confirm the improvement. 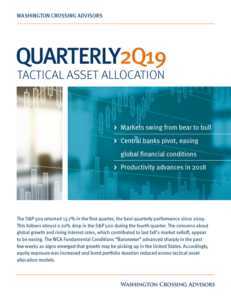 One positive takeaway from the first quarter shakeout has been an adjustment in valuations and profitability to more normal levels. Our long-run forecast equity returns now stand near 6.4% versus a 5.75% expectation at the start of the year. Less drag from normalization of profit margins and valuations account for most of the improvement in the forward view. 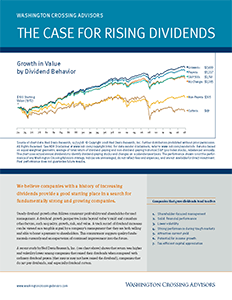 In order for us to become more constructive and boost equity exposure, we need to see a sustained pickup in fundamental conditions materialize through the lens of our fundamental analysis. As of this writing, we are not sufficiently convinced that turn is yet in place. Accordingly, we continue to maintaining a relatively conservative portfolio stance.